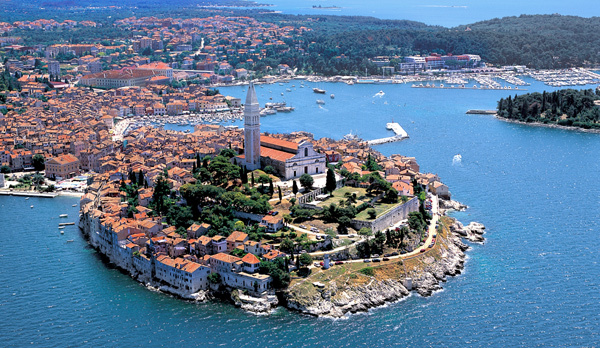 You will find the beautiful town of Rovinj, 90 kms south of Trieste on the Istrian coast. 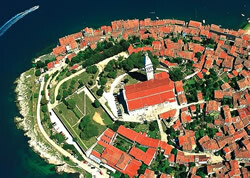 This Old Town rises up on a peninsula. It was declared a cultural monument in 1663. The town has two main gates facing the sea - only the main entrance is facing inland. The town was divided by a canal from the mainland. Though the canal has been filled in, the main entrance is still looking and standing majestic over Rovinj's main square. The old town was built Venetian style and in the centre of the island's traditional part you can view St Euphemia cathedral in its full glory. The inside of the cathedral was built in baroque style and also offers 360 degrees panoramic view of the surroundings. The tower rises high above to expose 30kms of the Bruin group of islands and the other 13 surrounding islets. The cathedral's parallel running narrow streets lead straight to the ocean via a circular road that take you down to the bottom of the city's walls where you will discover markets located around the old fountain in the centre of the main square.